Our Armed Forces and security services are rightly celebrated across the region, the continent and the world for their professionalism and contribution to global peace and security. I thank the officers and the men and women of the Ghana Armed forces, the police service and the other security services for their display of order, pomp and ceremony. And I thank them all for their willingness to put their lives on the line to secure our domestic peace and tranquility and the sanctity of our property. This was probably one of the most dramatic interventions in the colonial history of our country. One hundred and twenty years after that event, its significance might be lost on us. The very same objectives of the Crown Lands Bill were introduced at the same time and became law in countries like Kenya, Zimbabwe, Zambia and other British colonies around Africa and changed the course of their history. The lands of the indigenous peoples were seized by the British Crown under that law, an event from which, a century later, they have still not recovered. In what was then the Gold Coast, our lands remained ours because of the bravery of the members of the Aborigines Rights Protection Society, and we must pay homage to these patriots every day, especially on this 60thanniversary. Even though we established and secured, in 1897, the continuing and inalienable rights to our lands, we remained a colony and could not govern ourselves. The founders of the UGCC, then, met to demand independence from the British and 70 years after that event, one still marvels at the clarity of thought and the passion that they displayed. Some of the names of that momentous day have survived in our written history and folk memory. Five of them are on our Ghanaian currency: Joseph BoakyeDanquah; Emmanuel ObetsebiLamptey; William Ofori-Atta; Ebenezer Ako-Adjei; and Edward Akufo-Addo. Kwame Nkrumah, the sixth of the Big Six on the currency, was to join them later. The speech, the Ghanaian colossus, Danquah, made on that day, deserves to be quoted liberally on a day like this. He said: “Love of freedom from foreign control has always been in our blood. 870 years ago we struck against the attempt of the Arabs to impose a religious slavery upon us in Ghana. We left our homes in Ghana and came down here to build a new home. But there is one thing we brought with us from ancient Ghana. We brought with us our ancient freedom. Danquah captured the mood of the time and set our country on the path to independence. 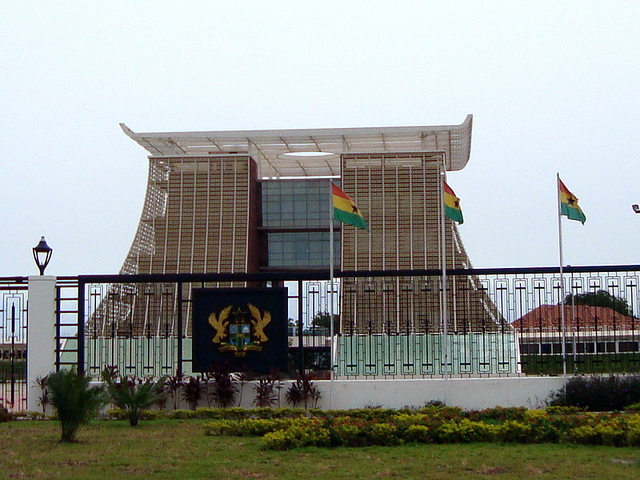 4th August is truly a sacred and seminal day in the annals of the Ghanaian people. The unfolding of the story is well known. Eventually independence came and Ghana, under the leadership of Kwame Nkrumah, became the first sub-Saharan country to gain its freedom on March 6, 1957. Danquah had done the research and convinced himself and others that the bulk of the people that inhabit these lands migrated from the ancient kingdom of Ghana. In 1957, we lowered the British flag and we jettisoned the name Gold Coast that had been given to us and took on the name, Ghana, the name of our ancestral home. 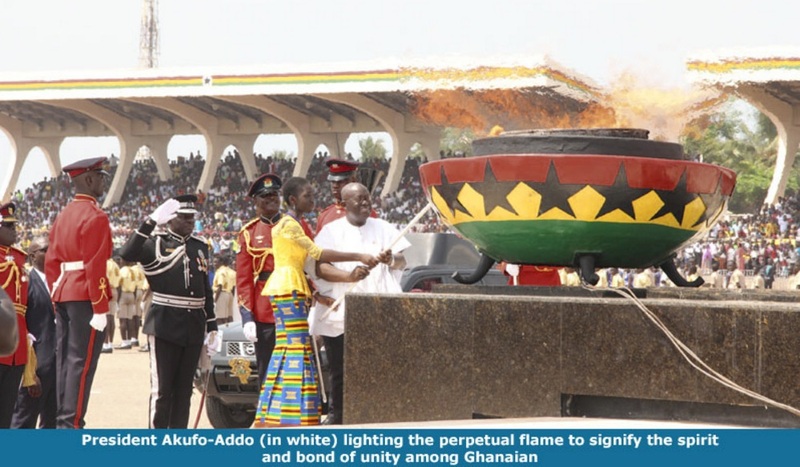 The name Ghana was meant to give us a fresh start and mark the break from colonialism; and it was also meant to give us a sense of our historical roots and the assurance that we have a history, culture and civilization that preceded colonialism. I pay homage to Ephraim Amu, Tata Amu as he was fondly called. He was the composer of what easily passes as our unofficial National Anthem, Yen AraAsase Ne. Is there a Ghanaian among us today who can sing or hear that song, in whichever language, without being moved? I pay homage to Apaloo, the poet who immortalized the philosophy and music of the Ewe language. I pay homage to E.T. Mensah, King Bruce, Jerry Hansen and the others who popularized highlife, which has become an enduring identity of Ghanaian music. I pay tribute to the great musicologist, J.H. Nketia, who is the great authority on African music. traditional arts and medicine. It is thanks to him that herbal medicine became a respectable subject of study and research in our country. We are equally grateful for those in the Opposition at independence, who, at great personal cost and in defiance of the infamous Preventive Detention Act of 1958,were determined to hold aloft the banner of freedom, and who insisted that the multiparty democratic state was the best form of governance for our nation. I refer to Joseph Boakye Danquah, Emmanuel Obetsebi-Lamptey (Liberty Lamptey), Simon Diedong Dombo, Kofi Abrefa Busia, Baffuor Osei Akoto, Victor Owusu, R.R Amponsah, Joe Appiah, S.G. Antor, Modesto Akpaloo, Ashie Nikoi, Attoh Okine and others. Our generation of Ghanaians have vindicated their stance. On 7th December, 2016, the Ghanaian people exercised their sovereign franchise, in a dignified and serene manner, to remove an incumbent and elect a new government, and, thus, demonstrated again their deep attachment to democratic values and governance. materialised. Sixty years after those heady days, too many of our people continue to wallow in unacceptable poverty. We will achieve these goals when we move and act as a united people. We must take pride in our diversity by all means, but the Ghanaian must always rise above the ethnic or sectional interest. We have a bright future and we must mobilize all our resources and all our strengths, here and in the Ghanaian Diaspora, to get to that promised land faster. I have confidence that we can and will achieve the dreams of our forebears. I am hopeful that we will continue to make ourselves worthy inheritors of this land. I know that we will wear the accolade of being a Ghanaian with pride. Let us mobilize for the happy and prosperous Ghana of tomorrow, in which all of us, including our youth, our women and the vulnerable in our society, will have equal opportunities to realize their potential, and build lives of dignity. Then, our independence will be meaningful. Then, we will have a Ghana beyond aid. I wish you all a happyDiamond Jubilee anniversary and God’s blessings. Kwame Nkrumah was the leader of Ghana from 1951 to 1966. Overseeing the nation’s independence from British colonial rule in 1957, Nkrumah was the first President of Ghana and the first Prime Minister of Ghana.